Posted on February 14, 2017 by admin wrote in News. 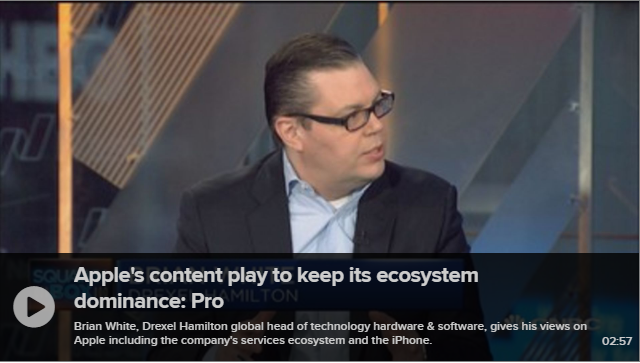 Apple’s soaring stock will have little effect on the tech giant’s mission of building out its plentiful “ecosystem” of devices, software, and eventually, content, Drexel Hamilton’s Brian White told CNBC on Tuesday. Apple closed on Monday at record-high $133.29 a share, nearly a 10 percent gain since the company released earnings on Jan. 31. Apple also topped the charts of the smartphone market in the fourth quarter of 2016, taking an 18 percent share and reaching the number one spot for the first time since 2011. But content has been a source of rivalry in the tech world, and competitors like Google and Amazon are racing to add more to their platforms before Apple does, said White, Drexel Hamilton’s global head of technology, hardware and software. “What you’re starting to see … is other ecosystems start to bring in content, and Apple really hasn’t done that in a big way,” he said. Amazon, a leader in content, and Microsoft could prove to be Apple’s biggest competition in the years ahead, White added. “I think you’ve got to think about what Microsoft does longer term. I mean, they’ve got a huge percentage of the desktop PC and mobile PC market, and where are they going to go?” White asked. Still, White contended that Apple has a healthy future. “It’s not just the iPhone 10. It’s also services — they’re going to double in the next four years. You’ve got a valuation that allows for upside. So there’s a lot [that’s] exciting to look forward to at Apple,” he said.